In the future European Air Traffic Management (ATM) system, the trajectory becomes the fundamental element of a new set of operating procedures collectively referred to as Trajectory-Based Operations (TBO). The underlying idea in TBO is the concept of business trajectory. The business trajectory is the trajectory that best meets airline business interests. This business interests may be, for instance, minimum duration, minimum consumption, or minimum operational cost. The TBO concept of operations and the notion of business trajectory will result in more efficient 4D trajectories that will be necessarily flown under the presence of constraints due to, for instance, airport operations or Air Traffic Control (ATC) intervention. Any modification in that trajectory will result in a change in the cost effectiveness of the operation. Thus, the future ATM system should modify the business trajectory as little as possible. Overall, the necessary tactical intervention will be limited to exceptions, so the development of techniques for strategic planning of business 4D trajectories will be key, resulting in significant fuel savings for airlines. The goal of this research activity is to determine the flight plan of commercial airplanes that minimizes the direct operative cost of airliners in a flight between two assigned airports considering, the existing non-flight zones, the weather information such as forecasted storms and wind and other constraints like passage over waypoints. Effective flight planning can not only reduce fuel costs, but also time-based costs and lost revenue from payload that can not be carried, simply by choosing efficient routes and altitudes, speed, and the optimal amount of departure fuel. The flight planning problem can be regarded as a trajectory optimization problem. The trajectory optimization problem can be studied as an optimal control problem of a dynamic system in which the goal is to find the trajectory and the corresponding control inputs that steer the state of the system between two configurations satisfying a set of constraints on the state and/or control variables while minimizing an objective functional. The use of these optimization techniques in flight planning allows a substantial fuel saving that is a strategic aspect for flight companies and has the additional positive effect of reducing CO2 emissions. Multiphase Mixed-Integer Optimal Control Approach to Aircraft Trajectory Optimization. P. Bonami, A. Olivares, M. Soler, and E. Staffetti. Journal of Guidance, Control, and Dynamics. · Hybrid Optimal Control Approach to Commercial Aircraft Trayectory Planning. M. Soler, A. Olivares and E. Staffetti. Journal of Guidance, Control, and Dynamics. 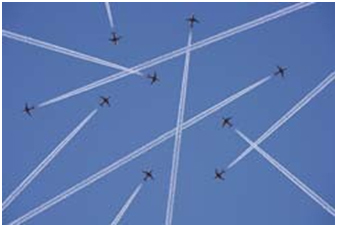 The air traffic system is safety critical and large scale. Its operations are vulnerable to traffic fluctuations and weather hazard uncertainties. The Air Traffic Management (ATM) system has historically grown along highly structured airspace with various restrictions on aircraft trajectories in order to ensure safety, predictability and ease of control by human operators. With the projected increase in air traffic, it becomes critical to develop algorithms to ensure safety with respect to nearby aircraft and hazardous weather while optimizing performance of individual aircraft. The proposed Trajectory Based Operations (TBO) concept, pursued in Europe and the United States, will provide the capabilities, decision support tools and automation to manage aircraft movement by trajectory. Moreover it will give aircraft flexibility to fly trajectories that meet their own interests, such as minimizing fuel consumption, but always under the agreement of Air Traffic Control (ATC). Automation tools need to be designed to fly optimal and accurate 4D (space and time) trajectories. The design process must consider that the trajectories are implemented under supervision of pilots and in communication with ATC. A hybrid optimal control framework is proposed, consistent with operations of air traffic controllers, pilots and autopilots, for strategic (20 minutes to one hour) de-conflicted trajectory planning. The main contribution of this research line is that the conflict free trajectory planning can be formulated as a hybrid optimal control problem. By including accurate nonlinear aircraft dynamics and constraints 4D trajectories can be obtained while minimizing fuel consumption. In addition, by including hybrid modes of flight, the proposed method can be integrated with the current procedures implemented by pilots, autopilots and air traffic controllers. Multiphase Mixed- Integer Optimal Control Framework for Aircraft Conflict Avoidance. M. Soler, M. Kamgarpour, C. J. Tomlin, and E. Staffetti, 51st IEEE Conference on Decision and Control (CDC 2012), December 8-11 2012, Maui, Hawaii, USA. pp 1740-1745. Hybrid Optimal Control for Aircraft Trajectory Design with a Variable Sequence of Modes. Maryam Kamgarpour, Manuel Soler, Claire J. Tomlin, Alberto Olivares and John Lygeros. Proocedings of the 18th IFAC World Congress; Milano, Aug. 29- Sep 2, 2011.ISBN: 978-3-902661-93-7.